Warsaw, 10 August, 2016 – Marek Belka, a former Prime Minister of Poland and a governor of the the National Bank of Poland – the country’s central bank – joins the Board of Directors at Echo Polska Properties (EPP), which lists on the JSE in September following a listing on the Euro MTF market of the Luxembourg Stock Exchange (LuxSE) in August. Warsaw, 10 August, 2016 - Marek Belka, a former Prime Minister of Poland and a governor of the the National Bank of Poland – the country’s central bank – joins the Board of Directors at Echo Polska Properties (EPP), which lists on the JSE in September following a listing on the Euro MTF market of the Luxembourg Stock Exchange (LuxSE) in August. Mr. Belka, who will start his duties as an Independent Non-Executive Director in August 2016, says he is very excited about the prospect of applying his professional experience in the real estate area. “This is the sector with the highest growth potential, and this has been confirmed by various recent economic indicators,” he says. Mr. Belka points out that June forecast by the Organisation for Economic Co-operation and Development (OECD) holds that Polish GDP could increase from around 3% in 2016 to 3.5% in 2017 – which is up from only 1.3% in 2013. “Economic activity in Poland continues to expand. Rising employment and wages, higher social transfers and low energy prices are expected to support faster consumption growth, which in turn drives the growth potential of the retail property market,” he adds. He says the increase in economic activity and infrastructure development will continue to drive prospects in the real estate market, and particularly in the retail sector. 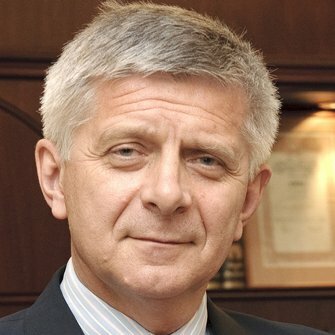 Marek Belka is a professor of Economics, a former Prime Minister and Finance Minister of Poland, former Director of the International Monetary Fund's (IMF) European Department and the governor of the National Bank of Poland. Belka graduated from the Socio-Economic Department of the University of Łódź in 1972 and later studied on scholarships at Columbia University, University of Chicago and London School of Economics. He holds an M.A. in economics of foreign trade and a PhD in economics from the University of Łódź. He became a professor in 1994. He was a member of the Board of Directors of two Polish commercial banks in Poland and served as Chairman of LOT Polish Airlines.